NOTE: In order to access various digital content while connected to the VirtualShield VPN, you do need to purchase the Unrestricted Streaming add-on. If you don't have an account with us, click here to sign up. if you do, please login to manage your account. Assuming you already have subscribed to the Unrestricted Streaming add-on, please follow the steps below to access digital content (like Netflix, Hulu, and HBO Go) from any of your favorite devices. Open the VirtualShield app or your favorite device. If you aren't already logged in, please do so. If you need an account, click here to sign up. From the main screen, click the arrow at the bottom right of your screen. The "Choose Location" screen will appear. 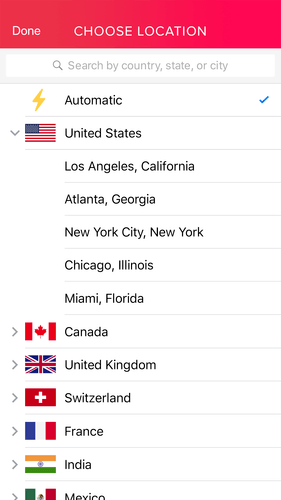 Tap on the country "United States", and select the "Unrestricted Streaming, USA" option. Click the "X" or "Done" icon to close the "Choose Location" screen. 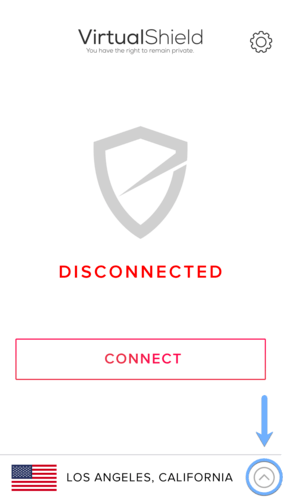 Click "Connect" on the VirtualShield app's main screen. That's it, you are now connected to our specialized Unrestricted Streaming location. You will now be able to access your favorite services while being protected by our state of the art network.